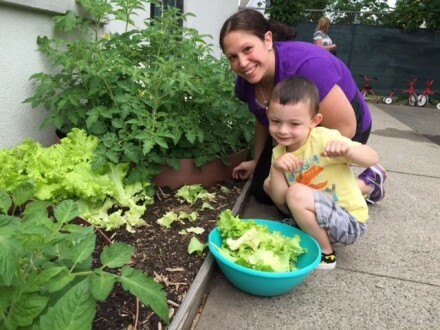 The children, staff, families, and volunteers from the West Haven Child Development Center in West Haven, Connecticut, united as a team to implement an innovative preschool garden project. The children and teachers from each classroom rotated caring for their garden by watering and weeding each week. Classrooms worked together to collect leftovers from breakfast, lunch, and snack to add to compost each day. During classroom science activities, each child was given the opportunity to start a seedling. Families were encouraged to be involved in the entire process: from the initial planting in the classroom, through transplanting the plants to the outdoor garden when big enough. Parents also weed and water the garden with the children. After reading the book Seed, students explored different type of seeds (sunflower seeds, pumpkin seeds, herb seeds) and planted an inside herb garden. Upon reading the story Jack and the Beanstalk students created paper greenhouses in which they germinated five of their own ‘magic’ beans. When the students read This is Your Garden, they created small, individual flower and vegetable gardens. Initially all vegetables and flowers were grown in the science center. Students nurtured the seeds by watering, reading to the seeds and rotating the containers to make sure their seeds received enough sun. When the seeds grew into the seedlings, seeds were transferred into an outside garden where students continued to nurture their seeds by watering, observing, weeding, measuring and harvesting the garden. Stacy Paridis, the center’s cook, has been using the herbs and vegetables from the garden in her daily lunch menus. There are buds on many more plants, and everyone is waiting anxiously for them to sprout. These will also be added to future daily lunch and snack menus. The preschool garden project is providing a unique interactive learning opportunity for children, families and staff. Let’s Move! Child Care (LMCC) joined the other Let’s Move initiatives for a gardening event at the White House. Children helped plant vegetables in the White House Garden with the First Lady. Two children from CentroNia in Washington DC represented LMCC. Search the recommended book list of Growing Minds, a program of the Appalachian Sustainable Agriculture Project (ASAP). Find books to teach about gardening, cooking, farms and food.